With the entire state of Utah seemingly on flood watch – in addition to other parts of Idaho and Wyoming – us anglers are having a hard time finding “good” water. While having too much precipitation this winter is a problem we’re grateful to live with, it does mean the local tailwater will be more crowded than normal, thanks to the high, muddy water in other streams. It’s certainly easier to fish clear water, but you can – and should – fish high and muddy water this time of year. The trick is learning to read that water, identifying likely trout lies, and getting your flies to them as quickly as possible. High water means a swifter current, which means trout will head for the best holding water possible. This is commonly referred to as “slack water” or “dead water.” Fish generally don’t hang on the seams when a river rips a hundred to a thousand CFS faster than normal. The below shot shows me in the Green River above Warren Bridge, just west of Pinedale, Wyoming. It was taken while I was writing a review on the Sage MOD, and understandably it’s one of the photos that got tossed (I was facing downriver trying to cast to and snag a bottle of Frog’s Fanny which had fallen from my vest pocket. It didn’t work). The rock shelf to my left provides a tumble of water and a few short feet of slower water. These pockets are always productive, but during high water they’re more attractive to trout due to the crush of bugs the water brings, and the fact it’s the only good holding water in the vicinity. The weeds along the far bank, right above the rapid in the top-right corner of the photo, provide good holding water as well. The gradient is noticeably narrower, the water shallower, and the current slower as it goes through the weeds. Lunker trout may not hold there, but casting a streamer in that water a few times would probably produce a fish. The most important thing to remember when reading high water is that fish aren’t along the seams, are rarely looking up unless there’s a great hatch, and they’ll be highly concentrated in the best holding water. Euro nymphing is my favorite way to fish water like this. 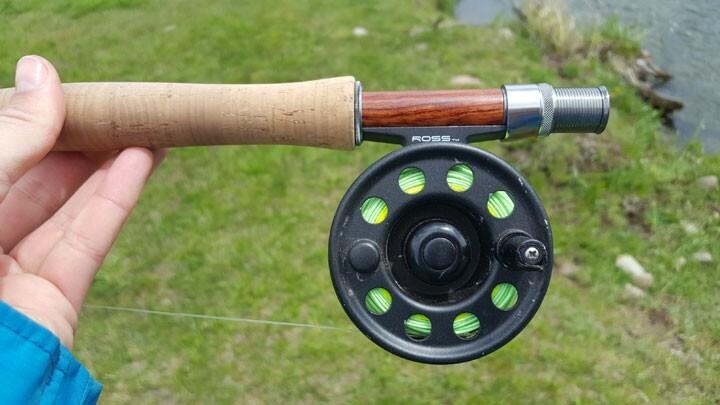 A nice 10’6” 3wt rod gives you the reach and sensitivity to plunk heavy flies right on the nose of unsuspecting trout. Over the past month, I’ve had the fortune of fishing with some of the best Euro nymphing anglers in the world. Watching them fish have been some of the best fishing lessons I’ve ever received, which is why I still posit that every angler should take a guided trip once or twice a year. Watching these experts fling flies is an incredible way to grow your angling skills. Now, back on topic – I’ve seen Euro nymphing work in water just like what I fished on the Green. This rainbow came off a Euro rig in water that’s almost always turbid. The key to presenting flies in high water conditions is getting them down as quickly as possible. Again, unless there’s a significant hatch, trout aren’t going to rise to a size 16 when they’re fighting 3,000+ cubic feet of water per second flowing through their home. 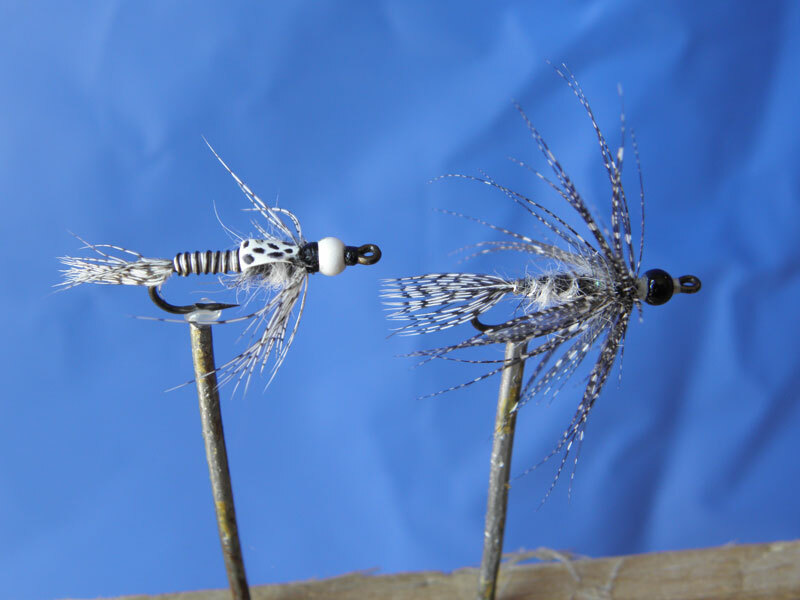 Weighted stoneflies, San Juan worms, and caddis larvae are great flies to use this time of year, whether you Euro nymph or throw flies under an indicator. The other obvious choice is to use a streamer. This brown, caught two weeks ago off the Green below Flaming Gorge, fell prey to a white marabou streamer stripped through a big pool of dead water. The flows topped 3500cfs that morning, creating high but not muddy water conditions. The fly itself is weighted with lead on the shank, then a big tungsten bead, followed by eight feet of 10-pound fluorocarbon and another five feet of type one sinking line. Since the water moves quicker when it goes up, your window of opportunity for a presentation is that much shorter, so heavy rigs are essential to success. Fishing high water is an exercise in patience, but if you put the time in you’ll learn a ton about trout, how they react to sudden water changes, and best of all you’ll become a better angler. Spencer Durrant is a novelist, outdoors columnist, and sports writer from Utah. Connect with him on Twitter/Instagram @Spencer_Durrant.